You awake one morning from uneasy dreams to find yourself transformed in your bed into a giant insect. What has happened to me? you think. That evening, the hive mind calls you to a new location. Six of your brethren take the stage to enact their own creative transformations. One artist reads from a giant pad of paper, ripping each page as the story unfolds. Another draws a love interest with a skin disease, his artistry projected on a screen above him. A woman wears a coat; a man wears a thong; a trumpeter blares staccato notes in an unknown key. BRAIN FRAME, you hear yourself intone. Expanded comics. Expanded minds. As well as live synth soundscapes by Tyson Torstenson. IMPORTANT: Brain Frame has moved to a new location! This show will be at Heavy Gel, a new artists studio and resource center. Located on Lake Street around the corner from Western, it's a short walk from the Damen or California Green Line stops, or the Western or Damen bus lines. Street parking abounds. Local bakery D-ology will be selling vegan, gluten-free, and non-considerate cookies, and BF alumni susan sarandon will be selling Brain Frame's first t-shirts. View the design here. Aaron Renier and I designed this poster. You can view a larger version here. It's a hospital noir murder mystery. It begins in the upper left, where the 'Sapphic Slasher' breaks free, killing all her doctors. We can tell from the television in the nurse's lounge on the upper right that she was scheduled to receive a lobotomy. She ties up a nurse, stripping her and taking her clothes, then wanders into the cafeteria where she wreaks havoc, weilding a ketchup bottle like a prosthetic phallus, squirting ketchup all over the tables and floor. After that, she walks past the vending machine into her room, applies lipstick, then finds the Top Doc and, with a little wine and persuasion, leaves the woman naked and sated, smoking a cigarette on her desk. Next, she walks out into the lounge, scrawls names all over the window, and exits the building, escaping in Top Doc's red car. All of this information and more is visible through careful inspection of this perspective-defying, bird's eye blueprint, Family Circus footstep method, insane print. Aaron and I developed the story and layout together, then he drew all the people and stuff, then I drew all the blood and shadows, composited and colored this poster. Then, last night, Andrew Ghrist and I printed it. If you come to the show, you can buy a copy for the one-time-only price of ten dollars. I've opened an online shop. You can check it out here. Currently, merchandise includes heavy hitters like Compiled and Dock Ellis, and then a lot of posters including Go Down, Mr. Square, and Motion Sickness prints. More to come soon, including beautiful Risograph prints of Banana Glove Game. But wait! There's more! All of the Brain Frame screen prints are ON SALE until this Saturday! 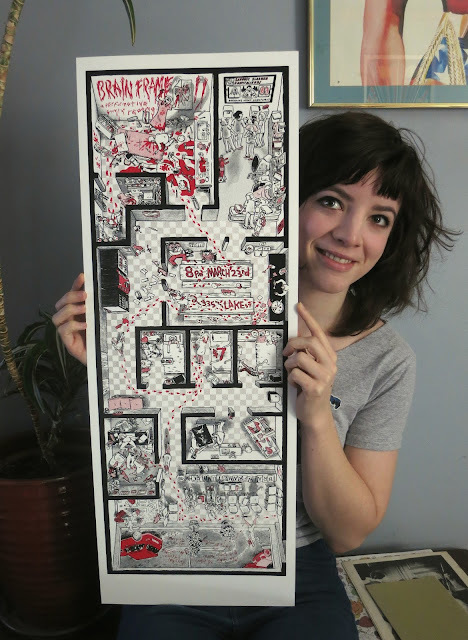 Half-size posters are $15, full size $20, and the newest print, seen above, is only $10. This is not a joke. These are totally insane, totally limited edition, totally high quality prints that should be sold for at least $65 if there were any standards at all where art meets commerce. But hey, I'm broke too. Get them while the getting's good.